The Journey Prone Recumbent is certainly unconventional. But that’s what makes it work so well for people with Cerebral Palsy, particularly those with high extensor tone and/or poor head and trunk control. For a person who cannot maintain an upright position, the Journey is the ticket to freedom. According to therapists, it’s the ultimate therapy tool. The trunk is well supported and this prone positioning decreases the muscle tone making it easier to actively move the legs reciprocally. The simple acts of getting on and off the bike, steering, pedaling and braking promote motor planning skills and hand/eye coordination. 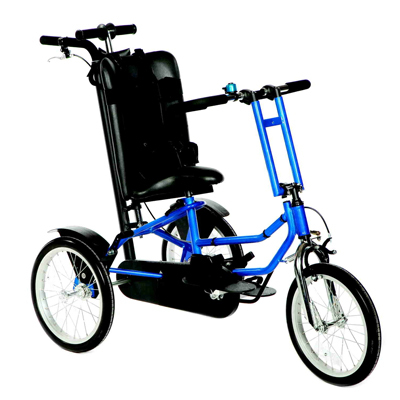 Fully adjustable seat, chest supports, handlebars and rear wheel housing allows for the Journey to grow with its owner. They also make it ideal for multi-user environments. Large foam handlebars make for easy steering. The device can also be pulled with a safety strap or steered by a caregiver with the side assistance handle, complete with emergency brake for easy mounting. 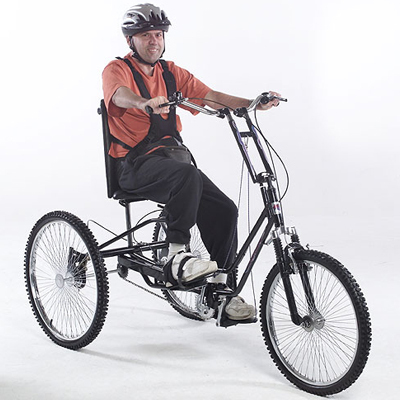 Fully adjustable seat, chest supports, handlebars and rear wheel housing allows the Journey to grow with its owner. They also make it ideal for multi-user environments. Large foam handlebars make for easy steering. The device can also be pulled with a safety strap or steered by a caregiver with the side assistance handle, complete with emergency brake for easy mounting. Call 604-821-0075 or request details about the Freedom Concepts Journey using the form below. Question about the Freedom Concepts Journey ?